Keeping teeth free of bacteria is a full-time job, and sometimes even the most consistent of brushers and flossers fall victim to tooth decay. If carried far enough, tooth decay can compromise the structural integrity of a tooth. In cases like these a dental crown can repair the tooth, giving it some added stability. Dental crowns can also repair cracked, chipped, or broken teeth. But did you know that there are three types of dental crowns? Your Reno dentists, Dr. William Wager and Dr. Brian Evans, discuss the three types and their uses below. The three types of dental crowns are all-porcelain crowns, porcelain-fused-to-metal (PFM) crowns, and all-metal crowns. Each type has its own strengths and weaknesses and may be used in different circumstances. For a tooth in the front of the mouth, where cosmetic results are most important, your Reno dentists, Dr. Wager and Dr. Evans, will likely recommend an all-porcelain crown. This type of crown offers the best cosmetic results of the three types. 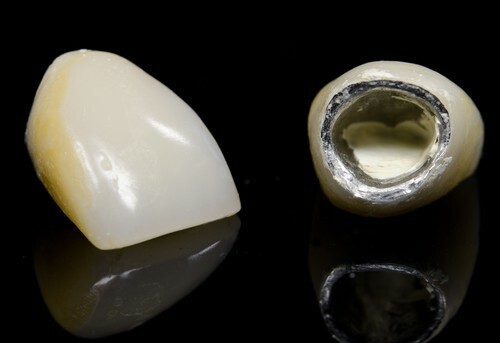 The porcelain material is customized for each patient to ensure that it mimics nearby teeth, and the material itself is translucent just like a natural tooth, meaning that even under direct light it is difficult to tell a porcelain crown from a natural tooth. For restorations in the back of the mouth, however, your Reno dentists, Dr. Wager and Dr. Evans, may recommend one of the other two types of dental crowns. The forces of chewing and biting are stronger in the back of the mouth, and porcelain crowns are the weakest of the three, so for some added stability, an all-metal crown or a PFM crown is a better option. An all-metal crown is the strongest, but a PFM crown is very sturdy and offers an outer layer of porcelain that can achieve a nice cosmetic result. Have your teeth suffered damage? Dental crowns can restore their appearance and their functionality. Schedule an appointment with your Reno dentists, Dr. Wager and Dr. Evans, today. Contact our 89502 dentist office at 775-829-7700. We are proud to serve patients in Reno, Sparks, Sun Valley, Spanish Springs, and surrounding communities.